The White House gathered a group of interoperability boosters on Tuesday for its forum on healthcare data interoperability, where the CMS and others pushed for greater data exchange, including for patients. "Our transition to a value-based #healthcare system depends on #interoperability," CMS Administrator Seema Verma tweeted at the beginning of the event. "People should be able to obtain their information and to share that information with just a few clicks." 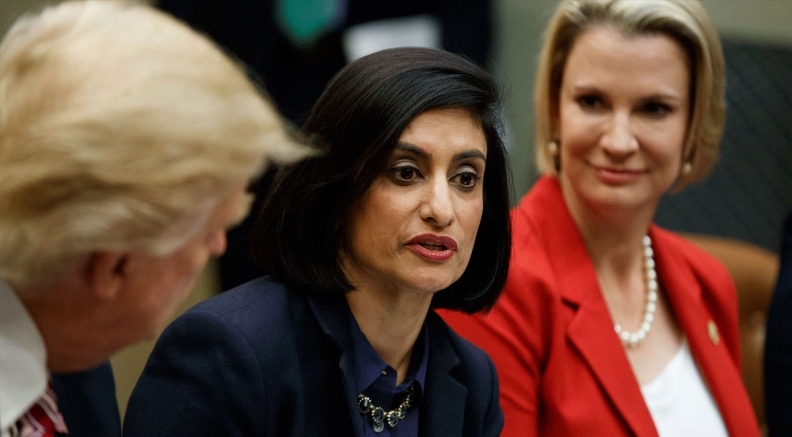 Verma touted the CMS' MyHealthEData, an initiative to give patients more control over their health data, as well as the agency's Blue Button 2.0, a program to use an API to give Medicare beneficiaries access to their claims data. She also floated the idea of opening Medicare and Medicaid data to researchers within the next year. In April, the CMS released Medicare Advantage data for the first time. Dr. Don Rucker, head of the Office of the National Coordinator for Health Information Technology, also discussed a combination of individual and bulk access to data and mentioned the OpenNotes initiative, which aims to give patients access to their clinical notes. That combination of small- and large-scale data-sharing could hint at what the forthcoming information-blocking rule will contain, said Dr. Doug Fridsma, president of the American Medical Informatics Association, who attended the forum. The rule is supposed to define information-blocking and set out exceptions to it. "My guess is the rule is going to address individual data and also this notion of population health analytics and providing a platform for researchers and others," he said. There was no explicit word about the timing of the rule—currently held up at the Office of Management and Budget—though Verma reportedly said the rule will "make interoperability a reality." "I am hopeful that we will get a nice gift somewhere between Hanukkah and Christmas around this regulation," Fridsma said. In general, attendees seemed to agree that the rule should be very clear. If it's not, it could have the unintended effect of decreasing data-sharing, Intermountain Healthcare Chief Medical Informatics Officer Dr. Stan Huff said. "People might be so worried about information-blocking that they won't do any information exchange," he said. "They're hoping the rule is unambiguous and that it's not going to lead to a whole bunch of court cases." HHS alluded to the much-anticipated rule in a recently released report, "Reforming America's Healthcare System Through Choice and Competition." In that report, the agency suggested that one way to boost interoperability would be for the administration to quickly put in place 21st Century Cures Act provisions that stop information-blocking. The OMB usually has 90 days from submission to review agency rules, which would put the deadline at Dec. 16. Greater interoperability that allows not only provider-to-provider data exchange but also data exchange with patients and payers would lead to more consumer-facing healthcare apps and would also make it easier for patients to switch providers, according to the report. But without widespread interoperability, "providers can use the switching costs and barriers to entry associated with incompatible health information systems to impede patient mobility and competition between providers," according to the report. Part of the problem, according to the report, is that much of U.S. healthcare still operates under a fee-for-service model in which provider systems might actually benefit from not sharing data. But, given what Verma tweeted about a value-based healthcare system, it remains to be seen whether the shift toward value-based reimbursement will encourage interoperability or whether interoperability will encourage the shift toward value-based reimbursement.